Hello! I am super excited to bring you Alexa and Avary on the blog today! Alexa and Avary are twins if you hadn’t guessed! They are seniors at Princeton High School and are members of the Class of 2019. Alexa describes herself as compassionate, fun and outgoing. Avary also describes herself as outgoing, along with funny and driven. Both are amazingly beautiful, inside and out! They are both involved in many extracurricular activities, including the National Honor Society and on the Student Council. Alexa is also a member of the Cross Country and Track teams, while Avary is involved with SADD and on the Prom Committee. After a couple of cancellations due to weather, we were able to meet up just after school started last fall. The twins decided on three locations, Downtown Anoka, Henry’s Woods Park in Rogers, and Otsego Park for the golden hour sunset. The weather was extremely warm and windy! We started off in Downtown Anoka, where we took some great urban shots. Alexa liked this location because it was “edgy” and had a lot of cool architecture and scenery. I take a lot of seniors to Downtown Anoka in the summer and fall. This is one of my favorite locations. It is so versatile. So many different types of brick backgrounds. It has a heritage-type feel and look to the downtown area. There are also some great parks and the beautiful Rum River Dam. We then headed to another popular area for families and seniors, Henry’s Woods Park in Rogers, Minnesota. The location has a great red barn, along with a beautiful bridge over a stream tucked back in the woods. It is by far my favorite place to shoot in the fall! Alexa chose to accessorize her wardrobe with a great wide brim hat to go along with her dress. She was looking for a natural and fun look! I couldn’t agree more! From Moments to Memories helps with this as well. I have several blog posts on how to prepare for your senior session, from outfit ideas to accessorizing. I also have a Senior Client Guide I will provide when you book with us. You can follow us on Pinterest for lots of tips on preparation as well! Avary was also going with a natural look, more so to show who she really is. She based her accessories off the look she was going for. Very natural and simple. All of the above made for some amazing images. We then headed to Otsego Park in Otsego where the golden hour sunset lighting was spectacular and made for some gorgeous backdrops! Both girls are beautiful, and the lighting only added to the ambiance. Avary wanted photos in a grass field, and they were gorgeous! Avary’s overall senior photo experience? If you want to check out some fun behind the scenes of this session and others, you can check out From Moments to Memories Instagram highlights (under “BTS”)! Make sure you follow us on Instagram: @frommomentstomemories! The girls will be attending college in the fall. Avary will be attending the University of Wisconsin-Eau Claire, where she will major in Marketing; Alexa will be going to the University of Wisconsin-La Crosse, where she will study Exercise Science. Both girls have a bright future ahead of them! Best wishes to Avary and Alexa with all of their future plans! Hello! I am super excited to bring you Ellie on the blog today! 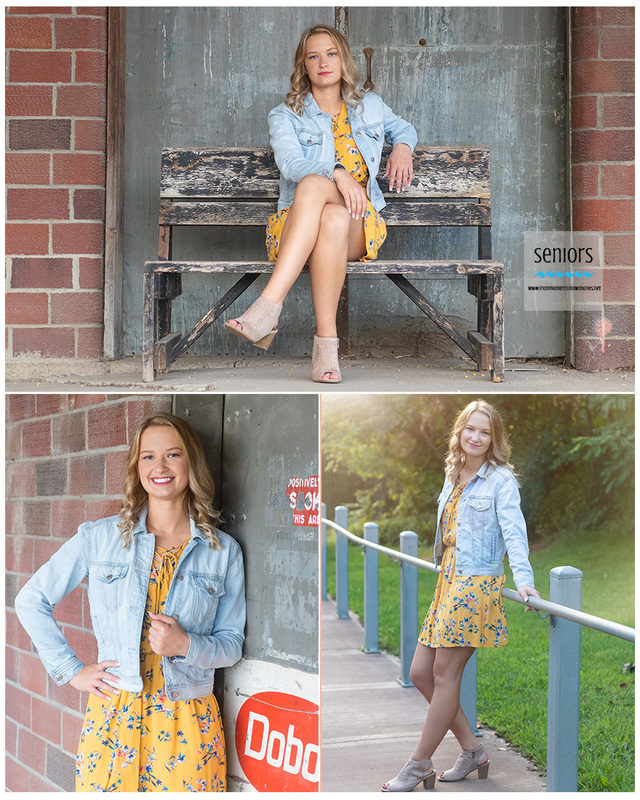 Ellie is a senior at St. Michael Albertville (STMA) High School and a member of the Class of 2019. She has managed the boys hockey team for three years. Ellie describes her self as friendly, smart and stubborn. I have to laugh because I know her mom, Lynne, and she is the same! After a cancellation due to weather, we met Ellie and her mom at their home, where my daughter Baylee did her makeup. Ellie loved the look so much! Baylee does a fantastic job with makeup and is something we offer all the senior girls for an additional fee. If you need your makeup done, Baylee is your gal! Ellie was going for a “mix of everything” for her senior portraits and that is exactly what she got! She chose an amazing wardrobe for the location and accessorized accordingly! Ellie chose her location because “it had everything”. And it did! Saying the Little Log House Pioneer Village in Hastings, Minnesota was amazing was an understatement. This was a new location for us and we were so excited to shoot there! For more information on this location, you can visit the website link above. This location had a little bit of everything! Old buildings, vehicles, a flower garden, an old train and tracks, etc. I can’t even begin to tell you how much was here. It was fantastic. I was so excited to find a new location that I had never been to. I do offer sessions here, but keep in mind they charge $25 for use, and it is an hour away from the NW suburbs of Minneapolis/St. Paul. We are in love with locations with old wooden buildings and barns. There were so many different ideas! I know we missed several spots because of the size of the place! We had so much fun exploring the property, and could’ve spent all night at this location! What’s one piece of advice Ellie has for other seniors during their senior session? The golden hour lighting was spectacular and made for some gorgeous backdrops. Of course Ellie is beautiful herself and really made our job easy! Ellie’s overall senior photo experience? Ellie will be attending the University of Minnesota-Duluth this fall, where she plans to major in Chemistry. We wish nothing but the best for Ellie in all of her future endeavors! Hello and welcome back to my blog! This week I am featuring AJ! AJ is a senior at Elk River High School and a member of the Class of 2019. His extracurricular activities include baseball and basketball. He enjoys the outdoors and skateboarding, as well as hunting with his dogs. I had a great time hanging out with him and his parents and those dogs! He describes himself as funny, outgoing and friendly. I agree wholeheartedly! He was so fun to talk to! AJ wanted his senior pictures to represent all sides of him in his natural every day look. One that showed his love of sports and also a bit classier look. Hales Field in Elk River is (and was) a huge part of his life with lots of memories, so we started out there for baseball shots. He brought all of his baseball equipment to “accessorize”. The lighting was fantastic this late summer evening. He is absolutely correct! From Moments to Memories helps with this as well. We have taken seniors all over the Twin Cities area and have great locations we can suggest. From urban to country, we know some awesome locations. We are always looking for new locations as well! We then headed down the road to Bailey Point Nature Preserve which is an amazing park. AJ’s opinion of the park? It is one of the most beautiful outdoor places in his home city of Elk River, Minnesota. I frequent the park quite often for my nature photography and love when my seniors pick this park. The sunsets here are fantastic and we even run into deer often on sessions at this location. As I mentioned, AJ also brought his pups along. They were so fun and friendly! At one point, one even jumped into the river! So much fun! What’s one piece of advice AJ has for other seniors during their senior session? AJ’s overall senior photo experience? AJ plans to attend the College of St Scholastica, major in secondary education, and pursue his dreams in baseball. I am sure that AJ will do well! His future looks very bright! Thanks to AJ and his parents for entrusting me with his senior photos! Up next for the Class of 2019 is Erin! Erin’s mom, Cindy, and I used to work together years ago. I was so glad when she contacted me for Erin’s senior pictures. It was great to catch up! Erin attends Spring Lake Park High School and is a member of the Class of 2019. She describes herself as fun, loving and energetic. Erin loves softball, basketball, shopping and binge-watching Grey’ Anatomy (don’t we all?). We decided on downtown Anoka for Erin’s shoot, because it is such a versatile location. It really is a “3 locations in 1’”. The park is right on the Rum River, and has a lot of great nature scenery for backdrops. The downtown area also has great backgrounds, along with the feed store down the street. Since basketball and softball are such a big part of Erin’s life, she brought her bat, glove, basketball and letter jacket for her senior portraits. Our last spot was also in Anoka, and it brought a more rural/country setting. The feed store has great farm-like backdrops that include a red brick building, some silos, and a few corn cribs. Erin brought a few clothing changes that went perfect with each area. She advises to be prepared and know your outfits before hand to make sure you’re comfortable. And to get your hair, nails and makeup done right before your shoot. Great advice, Erin! Erin's advice for those preparing for their senior session? "Know what you want for your pictures and communicate your wishes to the photographer." Erin plans to attend Minnesota State University, Mankato and obtain her degree in Physical Therapy. I also asked Erin what her overall experience was with her senior session. Her response? Good luck in all you do, Erin! I know you will succeed in reaching your goals! Hello and welcome back to my blog! This week I am featuring Bridget! I was so excited when Bridget’s mom, Nancy, contacted me for her senior session! I have known Bridget”s sister for many years, as my daughter had danced with her since kindergarten. Bridget is a senior at Elk River High School and a member of the Class of 2019. She is involved in archery and robotics. She loves programming and designing new things! Bridget describes herself as kind, quiet and giving. Bridget wanted her senior session in a natural, outdoor setting so I suggested both Bailey Point Nature Preserve and the Houlton Conservation area in Elk River. We started at the Houlton Conservation area, which is one of my favorite parks for senior sessions. It is along the river, and has an old barn-type building for great backdrops. Teenager getting her photo taken at an Elk River park in the country. She is absolutely correct! When choosing a senior photographer, make sure you check their portfolio/gallery for their photography AND editing style. This ensures a good fit with your senior photographer. Bridget brought a chair and some daisies along for her session. She brought the chair because she checked out the landscapes before hand, and thought the chair would look good with the back drops. She was right! And the daisies are her favorite flower. We headed down the road to Bailey Point Nature Preserve which is an amazing park. I frequent the park quite often for my nature photography and love when my seniors pick this location. The sunsets here are amazing, as well as the wildflowers in season. I loved that Bridget brought her own props. Bridget did her own makeup because she knew what she wanted and how she wanted it done. When in doubt! She went to Simonson’s Salon to get her hair done because it was less stressful to have someone else do it! She didn’t want any big or crazy accessories and chose a simple necklace and bracelet. I loved all her outfits, and the daisies made it all come together with her country theme. Toward the end of Bridget’s session, a few white-tailed deer even stopped by for a visit. Twins, even! Bridget was coaxing them in with her flowers, however they kept their distance. I was wishing I had my long lens to capture some close ups of them! Bridget’s overall senior photo experience? Bridget plans to attend Bethany Lutheran College in the fall where she will major in Chemistry. I know you will do well, Bridget! Thank you for trusting me with your senior photos!